– A neurotransmitter is released from a nerve cell by the arrival of an electrical impulse. 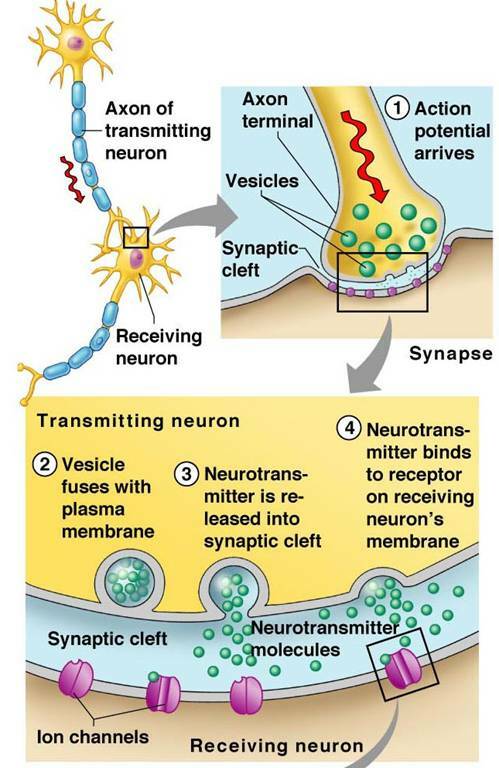 The impulse is transferred across the synapse to a target cell when the neurotransmitter binds to a receptor in the membrane on the postsynaptic side of the synapse. – Usually follows arrival of an action potential at the synapse. This causes the voltage across the cell membrane (membrane potential) of a cell (in this case a presynaptic neuron) rapidly rises and falls. Myelin sheath - consists of Schwann cells that encircle axon like a jelly roll, act as insulators and are separated by gaps of unsheathed axon called Nodes of Ranvier. Instead of a continuous traveling down the axon, the action potential jumps from node to node (called saltatory conduction), thereby speeding up propagation of impulse. ✔ Follows a graded electrical potential. ✔ Occurs without electrical stimulation as a low level “baseline”release. Neurotransmitter synthesis. Made via just a few biosynthetic steps, from simple precursors, such as amino acids readily available from diet. Have excitory or inhibitory effect (or both), depending only on the type of receptors they activate . An excitory effect increases the probability that the target cell will fire an action potential. 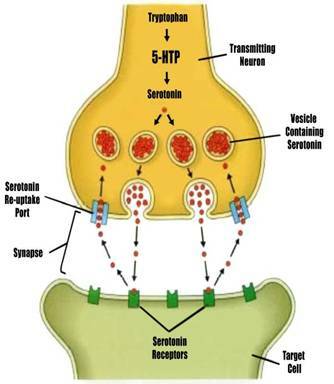 Re-uptake of neurotransmitters. For nerve cells to communicate, neurotransmitters are secreted by one neuron and picked up by receptor proteins on the surface of another neuron. Once the message has been delivered, a neurotransmitter is either destroyed or reabsorbed into the cell that made it and its activityis over. This process is known as re-uptake. Most psychoactive drugs exert their effects by altering the actions of some neurotransmitter systems. E.g. Addictive drugs, such as cocaine and amphetamines,primarily affect the dopamine system. Addictive opiate drugs primarily indirectly regulate dopamine levels. – Cocaine. Blocks reuptake of DOPAMINE back into the presynaptic neuron leaving DOPAMINE in the the synapse for a longer time to bind to receptors on postsynaptic neuron. This elicits a pleasurable emotion, until prolonged exposure causes down-regulation of receptors.